Sleeping on the weekends is rough. My flat is across the street from a bar that grows only louder and more crowded in the height of summer, so a good Saturday night snooze is usually out of the question. Raucous drinkers, the thump of the bass from the building, and the sound of my air conditioner create a cacophony nearly impossible to ignore. I’m not a fan. 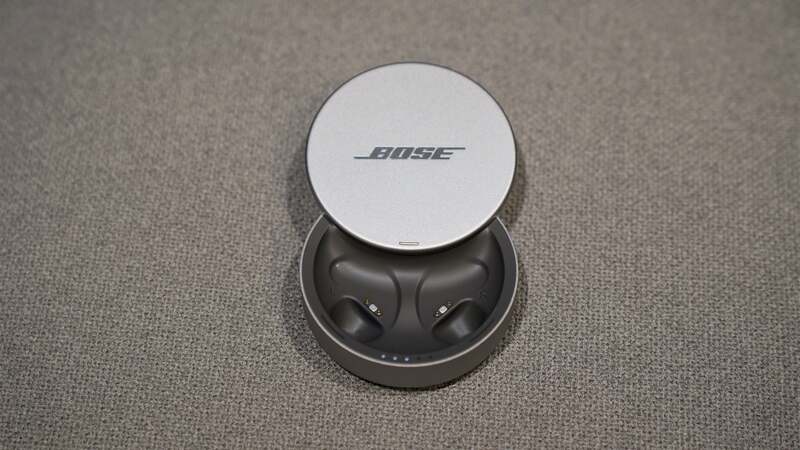 But Bose thinks its “Sleepbuds,” white noise masking earbuds designed to be worn during sleep (coming to the UK this autumn), can help alleviate the issue without resorting to the tried and true noise-cancelling technology used in some of its headphones. I get the appeal, but can a £229 white noise generator jammed in my ear canal really solve my sleeping problems? Turns out, they just might, though they’re a bit rough around the edges. 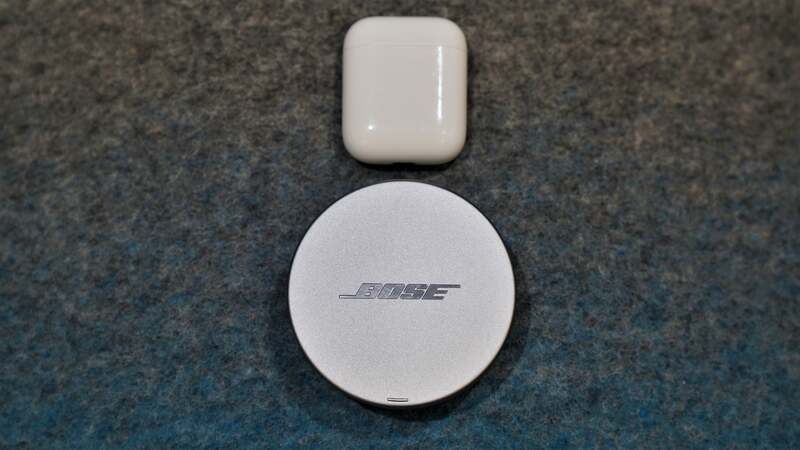 Bose’s Sleepbuds are tiny. Like, how can any sound come out of these, tiny. Removed from their rubbery sheath, they’re about the same diameter as a penny. 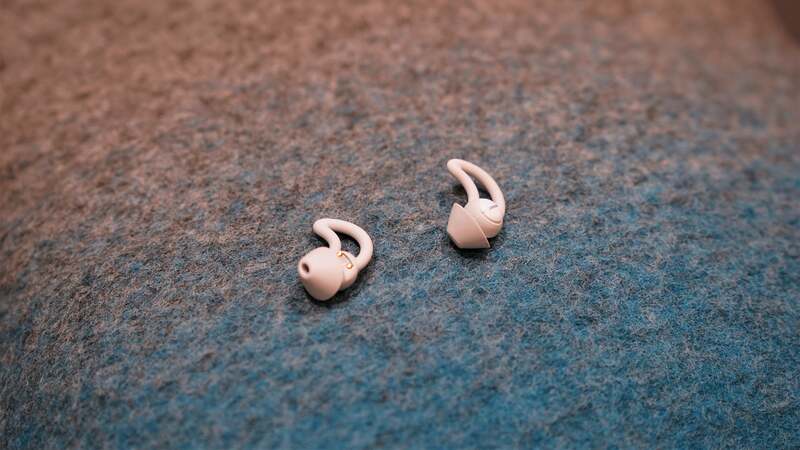 When inserted into the necessary rubber tips in which they sit, they still look ridiculously small, though still visually identifiable as earbuds. The charging case, the size of a hockey puck, is particularly sleek. Its top slides open easily, and uses some white LEDs and other indicator lights to show off battery level and whether or not the Sleepbuds have attached (magnetically) to their charging pins. To charge the Sleepbuds, put them in the case and plug in the case using a Micro-USB cable (really, guys?). You’ll get about two nights’ (up to 16 hours) worth of listening, with the case providing another full charge to get you through your slumber. Bose includes your standard trio of differently sized rubbery sheaths, which it calls StayHear+ tips. They’re made to block out ambient sounds, and since they sit so snugly in your ear, they’re pretty good at it. While three sizes are usually the standard, two or three additional sizing options would be a welcome addition, especially since these Sleepbuds are designed to be worn for extended periods of time. They fit my ears, but they might not fit yours. The most important aspect, of course, is how they feel. Too loose and they’re liable to shake out during any tossing and turning. Too large and you’ll have to deal with the eventual discomfort after having it in your ear during your hours-long rest, and laying on your side won’t be pleasant. As someone who sleeps with a single AirPod in his ear playing decade-old podcasts, I’ve definitely experienced the major pain of rolling over and pressing my head into my less than forgiving memory foam pillow. Bose’s Sleepbuds? They’re comfortable as hell. When I say they fit in your ear, I mean it. Laying on your side with your head pressed against the pillow will leave you pleasantly surprised by the fact that you can even perform the action while you’ve got audio being fed into your eardrums. But they’re not perfect. Every morning I woke with at least one Sleepbud dislodged from my ear. My partner used them as well and suffered from a similar issue, even after changing the tip sizes to create a more snug fit. 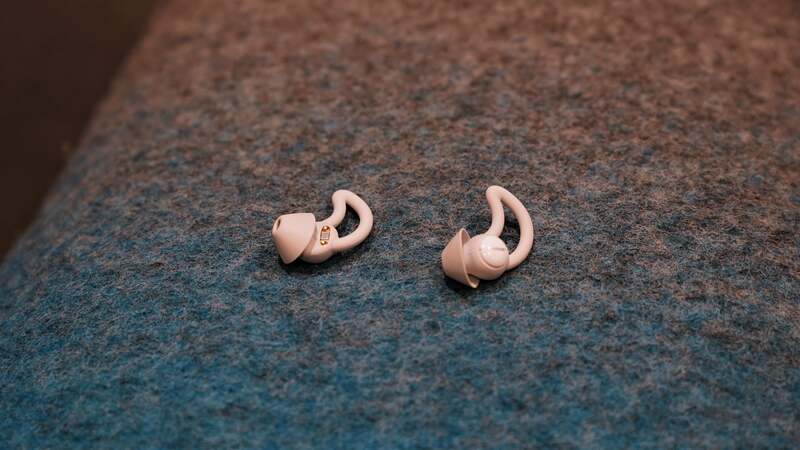 Whether it was a result of me tossing and turning or unconsciously attempting to dislodge the foreign entities from my ear canal, waking up with either one or both buds out of my ear made me wonder how effective these things would be as an alarm (another feature of the buds). But for the beginning of the night, when I need them most, the Bose Sleepbuds fit pretty well, and they play some decent tracks for trying to get me to sleep. There are a set of 10 sounds to choose from, ranging from the inside of an aeroplane cabin to waves gently lapping at a coastline. The recordings are preloaded onto the Sleepbuds themselves, and Bose says more sounds are on the way. The sounds are designed to mask particular frequencies most bothersome and detrimental to sleep rather than every loud noise you might encounter. Waves hitting the shore won’t do much against a car alarm, but they’ll sure as hell drown out your snoring partner. In terms of audio quality, these things aren’t winning any awards for the few sounds they do play. You’ll hear the chirping crickets, rushing waves, and other sounds that don’t exactly require the best in terms of fidelity. Noise masking is different from noise cancelling. Where the latter depends on a device with too much hardware to fit in your ear, the former just obfuscates the annoying noises in question with more pleasant ones slightly closer to your ear. Since the sounds are designed to mask and overpower the annoying sounds keeping you up, the idea is eventually you’ll tune out the unwanted noise and only hear the soft tranquillity of nature piped directly into your canal. Which, most nights, is what actually happened for me. Bose’s Sleepbuds app is easy enough to use, and makes setup pretty painless. You can use it to set time limits on playback, as well as activate the alarm mode (for obvious reasons). It’s also quite a looker, but it has a few kinks it needs to iron out. For one, you need to use the app to activate the Sleepbuds, at least for now. Controlling the Sleepbuds’ volume is another chore, as it doesn’t recognise your smartphone’s volume rocker. You’ll need to open the app, select whatever’s playing, and manually adjust the volume with a swipe. It’s a bit surprising there’s no feature that lowers the volume the longer I’m asleep, but the sound is not at all bothersome, even when it’s the only thing I hear. Luckily, Bose says it’s working on a phone-free mode so you can ditch the device, open your Sleepbuds, and nap away. Still, some device controls, even if they’re on the charging case itself, would be pretty useful, especially since grabbing my phone in the middle of the night to get better sleep is a bit backwards. So should you actually buy the Sleepbuds? If you need a personal white noise machine to usher you to dreamland every night, absolutely. Pop these things in your ear during a flight and catch some sleep, or save a partner who prefers ambient noise to white noise and finally unplug the white noise machine by your bedside. In a world where your smartphone wants to be your go-to device for everything from family photos to paying your mortgage, it’s actually a welcome change of pace when a device only does one thing. It’s even better when it does that one thing well. But these things are super pricey. I love sleep just as much as the next insomniac, but £229 is a lot of money to drop for something that isn’t cancelling the noise, only drowning it out. If it were a hundred quid cheaper, it’d be an immediate buy. For now, I suppose, it really depends on how much you value a good night’s rest. Thoughtful design, though it really should use USB-C.
Getting them in your ear is easier than getting them out. More eartips sizes, more colours, and more sounds would be ideal. The ability to upload your own audio would also be choice. Whether you miss listening to music or podcasts to fall asleep depends on your perspective.